Azure Search schemas do not explicitly support multi-level taxonomy categories, but you can approximate them by manipulating content prior to indexing and then applying some special handling to the results. 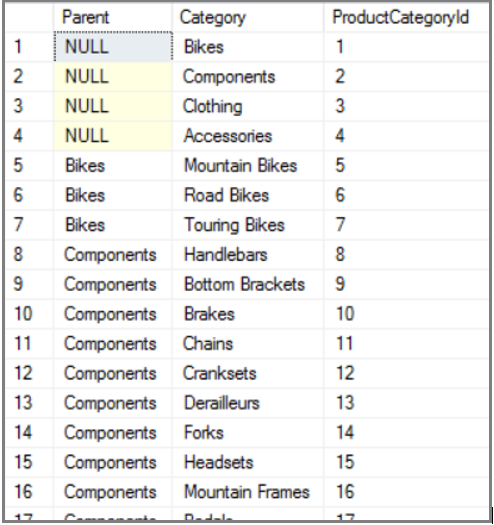 The example in this article builds on a previous example, Model the AdventureWorks Inventory database, to demonstrate multi-level faceting in Azure Search. In the index containing this structure, create a Collection(Edm.String) field in the Azure Search schema to store this data, making sure that field attributes include searchable, filterable, facetable, and retrievable. 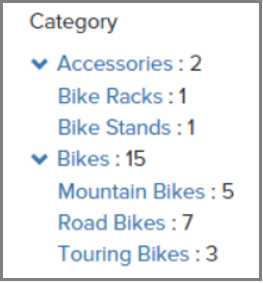 Notice the inclusion of the parent category "Bikes" in the child category value "Mountain Bikes". Each subcategory should embed its entire path relative to the root element. The pipe character separator is arbitrary, but it must be consistent and should not appear in the source text. The separator character will be used in application code to reconstruct the taxonomy tree from facet results. The count value must be high enough to return all possible taxonomy values. The AdventureWorks data contains 41 distinct taxonomy values, so count:50 is sufficient. In your client application code, reconstruct the taxonomy tree by splitting each facet value on the pipe character. 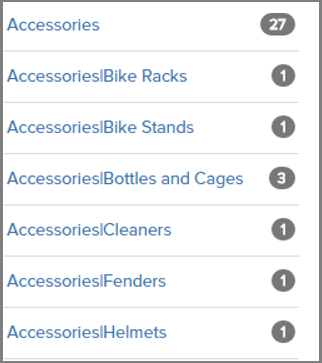 taxonomy/any(x:x eq 'Accessories|Bike Racks') returns only the documents with a subcategory of Bike Racks under the Accessories branch. This technique will scale to cover more complex scenarios like deeper taxonomy trees and duplicated subcategories that occur under different parent categories (for example, Bike Components|Forks and Camping Equipment|Forks). Query speed is affected by the number of facets returned. To support very large taxonomy sets, consider adding a facetable Edm.String field to hold the top-level taxonomy value for each document. Then apply the same technique above, but only perform the collection-facet query (filtered on the root taxonomy field) when the user expands a top-level node. Or, if 100% recall is not required, simply reduce the facet count to a reasonable number, and ensure the facet entries are sorted by count.